The Public Access Computer Station, or PAC Station is an ideal solution where space is limited and access to computer resources are needed. 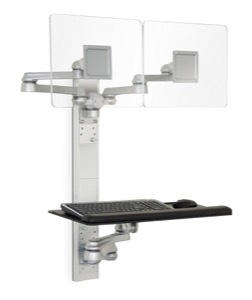 The PAC station typically mounts to a wall or pole and provides attachment points for the monitor, CPU and keyboard platform. 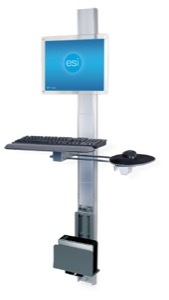 PAC stations are well suited for public spaces such as libraries and educational settings. 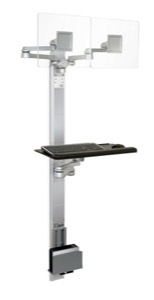 In addition, the PAC station can be very versatile in medical environments. They can be mounted in the patient rooms which allow the medical staff to interact and face the patient as they record vital information directly into the computer system. 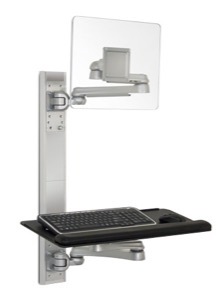 The ESI Titan track mount allows for easy vertical adjustment of both the keyboard and monitor positions. The expandable keyboard tray includes a mousing area which can be adjusted for both right and left-handed mousing. The keyboard tray also folds up to maximize space. 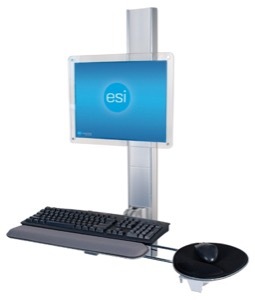 The ESI Titan track mount allows for easy vertical adjustment of both the keyboard and monitor positions. The expandable keyboard tray includes a mousing area which can be adjusted for both right and left-handed mousing. The keyboard tray also folds up to maximize space.